මේකේ වෙන වැඩ පිලිවෙල කීවොත් අපිට එවන Email Reminder එකක් විධියට Google Calender එකට ඇතුලු වෙනවා.ඊට පස්සේ Google Calender එකෙන් අපිට ඒ ගැන දැනුවත් කරන්න SMS එකක් එවනවා. 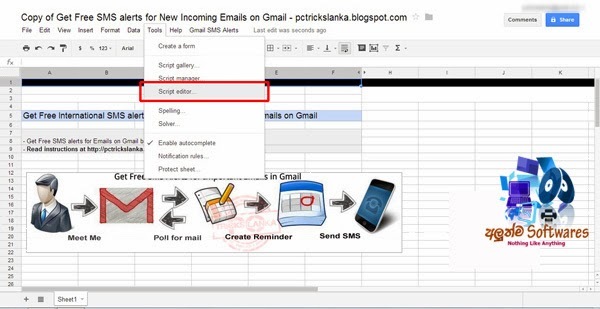 එහෙනම් අපි දැන් වැඩේ පටන් ගමු..මුලින්ම Gmail එකට Log වෙන්න. දැන් Search Bar එකේ පහලට තියෙන Arrow එක Click කලාම පහල තියෙනවා වගේ එකක් එයි. අපිට හැම Email එකක්ම SMS එකකින් ගෙන්වා ගන්න ඕනේනම් කරන්න තියෙන්නේ Has The Words කියන තැනට is:inbox කියලා දාන එක විතරයි. ඊට පස්සේ Create filter for this search > Click කරන්න. ඊට පස්සේ එන එකෙන් Apply the label කියන තැනට අපි අර කලින් හදාගත්ත label එක දාලා ඒක Tick කරන්න. දැන් Create filter Click කරන්න. දැන් තමා හොදම හරිය. මේ ටික හොදට බලාගෙන හරියටම කරන්න. දැන් පහල Link එකට යන්න. Yes,Make A Copy Click කරන්න. දැන් Tools වල Script Editor යන්න. දැන් Add a new trigger Click කරන්න. දැන් from spreadsheet කියන එක වෙනුවට Time-driven කියන එක දෙන්න.ඊට පස්සේ hour timer කියන එක වෙනුවට minutes timer කියලා දීල save කරන්න. දැන් Grand Access (Accept) දෙන්න. දැන් පහල Link එකෙන් Google Calender එකට යන්න. දැන් එතන Settings වලට යන්න. ඊට පස්සේ Send Verification Code Click කරන්න. Phone එකට එන Pin එක දාලා Finish Setup දීලා Save කරන්න. Then, SMS වලින් Notification එවන්න කියලා Tick උඩම හතරටම දාල කරලා Save කරන්න. ඔබගේ අදහස් Comment කරලා යන්න අමතක කරන්න එපා.